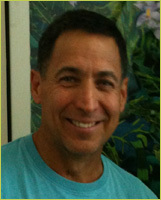 Stephen Matthews, D.C. comes to Pilates Plus Palm Springs with over 28 years in the area of health and wellness. A retired chiropractor Stephen owned and operated three Chiropractic clinics in the Los Angeles area. Starting with a background in massage that progressed to deep tissue body work and movement education Stephen continually challenged him to learn more which led him to his successful Chiropractic practice. Building on that success his next challenge was moving to Sydney, Australia where he was a partner in owning and operating the first Gold's Gym. Coming to Palm Springs to have a bit of break he soon was active in taking classes at Pilates Plus Palm Springs. Always up for a challenge he decided to obtain his Pilates certification and has become a wonderful addition to our staff. He provides a wealth of experience and knowledge in all his classes. Mostly he believes in sharing laughter.